Suldog over at Universal Hub says this site is his favorite reference for the growing swine flu pandemic, and it’s difficult to disagree. The site offers everything you need to know and more about the illness, and as a bonus feature comes written in seemingly randomized verbs and nouns. Influenza virus is mainly spread through the air and contacts, so when coughing or sneezing should cover the mouth, the nose; as a result of influenza virus can often be in some daily necessities to survive the surface for some time and should therefore wash their hands, but also regular daily use of alcohol for disinfection . In addition, as little as possible to the local people, but also reduce the probability of infection is an effective way. But swine flu is a relatively recent cause for concern. There are several pressing medical issues for which the site has already built an impressive body of work. Fart. Moore said, speaking with your doctor, because usually associated with eating fart can be by adjusting the diet and non-prescription drugs to treat. Mayo Clinical Medical College of Thielen said that in addition to eating beans, the use of straw to drink beverages and eat cruciferous vegetables will make fart. 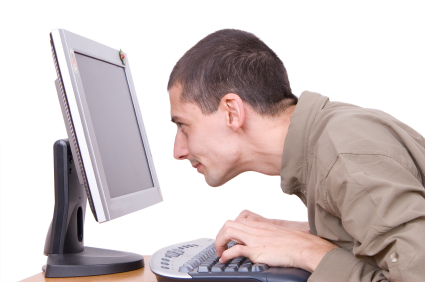 The site is especially useful for self-diagnosis and self-administered treatment plans. Now if I could just figure out how to for under tree make Special yoghurt spider, I may be able to finally get rid of these make hair back. 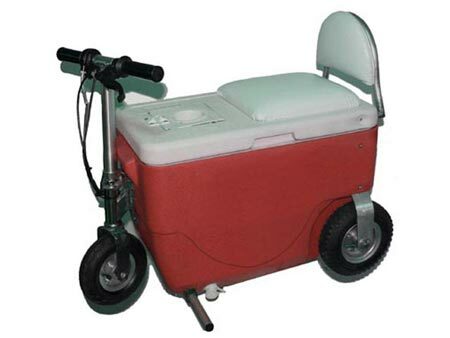 According to Universal Hub, the Massachusetts Appeals Court recently overturned someone’s drunk driving conviction on the grounds that he was on the grounds — of a campground. Full of coffee grounds. Behind the Ground Round. [T]he presence of a gate severely restricting general access to the campground is of great significance. The evidence established that no motorist approaching the entrance to the campground could suffer any illusion that he was welcome to enter the campground and drive on its roadways. The fact that the campground solicits business from the general public does not alter the equation; though members of the general public are invited to become licensees of the campground, they are not allowed into the campground unless or until they have acquired such a license. Even more than the fact of that limitation, the gate makes its reality abundantly clear to any putative visitor. In other news, I’m almost finished constructing a gate blocking off the route from my house to the liquor store. Johnny Law says it’s one way the wrong direction and you’re not allowed to drive on the sidewalk. I say take it up with the courts, Jack. Also, back up. I think I’m gonna boot again. Suddenly I have a new respect for turtles. Most of you did not have the privilege to attend Her Majesty’s Royal Academy of Butchery and Meatballing, so I imagine you may be a bit confused about the many different cuts of meat. 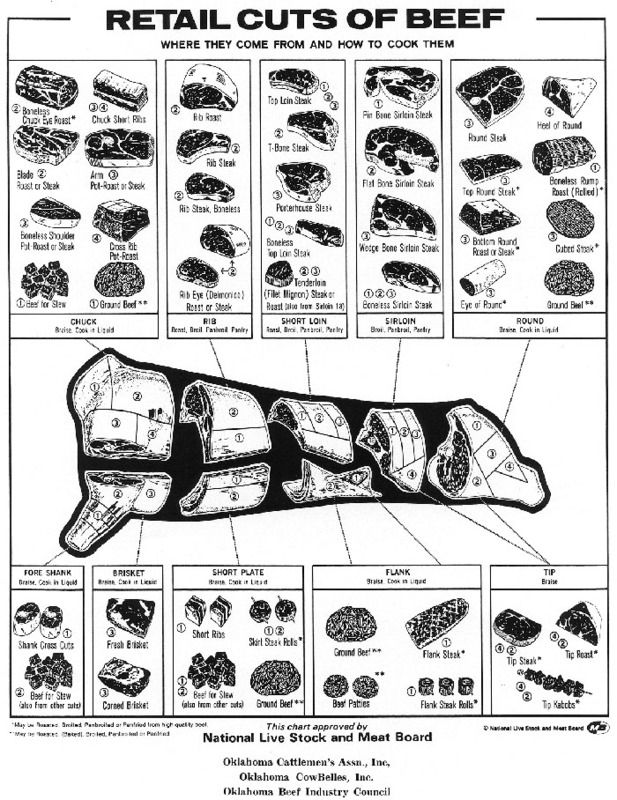 I’m sure you’ve heard of T-bones, filet mignons, New York strips, ribeyes, top sirloin, chuck roast, rump roast, brisket, flank steak, blade steak, tenderloin, and other cuts of beef, but do you have any idea how they came to be? After all, there are a million different ways to slice a cow. And as explained by my main man Bourdain, French butchers have an entirely different way of doing it than Americans. I’m sure the Japanese have their own way, which probably requires a blindfold, a samurai sword, and a monkey dressed like a space robot. The bottom line is that dead cows don’t come with perforations on their insides to show you how to cut them apart. Someone has to actually figure it out. The Denver was invented after meat and marketing experts spent more than $1.5 million and five years on the largest study anyone had ever done on the edible anatomy of a steer. The point was to increase the $15.5 billion a year that people spend at the supermarket buying beef. The association thinks consumers may pay $5.99 a pound for a Denver steak. As ground beef, it’s about $2.99. So yes, your grilling options are currently being conjured by multimillion dollar marketing studies. And no, it’s nothing to get all worked up about. After all, London Broil is just a fancy name for flank steak invented by butchers to sell cheap cuts of meat. Besides, I don’t see why anyone would shy away from the intersection of meat and marketing. For example, I think meat-based business cards are the coolest thing anyone has ever invented. Unless you do a lot of business with cows or people in India, obviously. Beagles are my all-time favorite type of dog. They are loyal, intelligent, and utterly unconcerned with fetching, rolling over, or performing any other feats they consider beneath them. 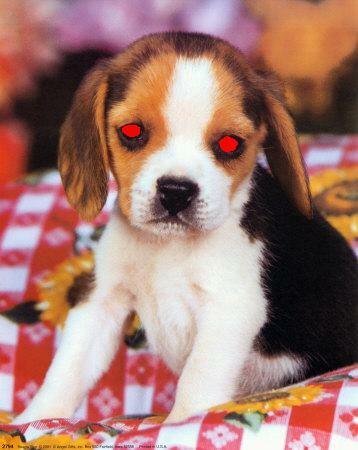 And now some Korean scientists have given beagle puppies the ability to glow in the dark. Because who wouldn’t want that? The four dogs, all named “Ruppy” _ a combination of the words “ruby” and “puppy” _ look like typical beagles by daylight. But they glow red under ultraviolet light, and the dogs’ nails and abdomens, which have thin skins, look red even to the naked eye. Seoul National University professor Lee Byeong-chun, head of the research team, called them the world’s first transgenic dogs carrying fluorescent genes, an achievement that goes beyond just the glowing novelty. “What’s significant in this work is not the dogs expressing red colors but that we planted genes into them,” Lee told The Associated Press on Tuesday. Hang on a minute… I think I’ve written about dogs in Korea before. As if Jeopardy needed even more socially awkward contestants, IBM says it is building a computer that will be able to compete with humans on the famous trivia game show. But chess is a game of limits, with pieces that have clearly defined powers. “Jeopardy!” requires a program with the suppleness to weigh an almost infinite range of relationships and to make subtle comparisons and interpretations. The software must interact with humans on their own terms, and fast. Indeed, the creators of the system — which the company refers to as Watson, after the I.B.M. founder, Thomas J. Watson Sr. — said they were not yet confident their system would be able to compete successfully on the show, on which human champions typically provide correct responses 85 percent of the time. 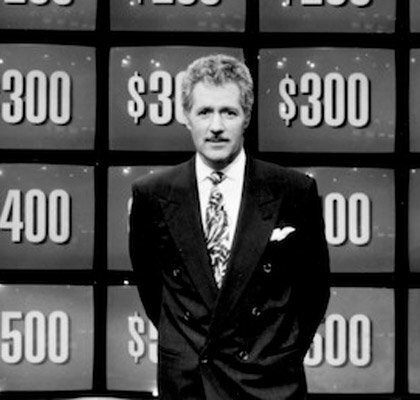 I think the IBM machine will lose because there’s no way a computer designed to interact with normal humans will be able to handle Alex Trebek without popping wires and sizzling like in a 1980s movie. Unless they can hard code a douchey condescension dissipator into the BIOS layer, of course. I don’t know. I hate technology. Horses are among nature’s most proud, and prideful, animals. Behold the majesty of Arabian rising on its haunches, or the way a Kentucky thoroughbred puffs out its chest and prances after winning a race. However Alfie clearly enjoys the look and groom Justine Greenslade said all efforts to clip it had been in vain. Moustaches are relatively rare on horses although they are noted among Friesians, which are said to be able to grow ones to rival surrealist painter Salvador Dali’s. 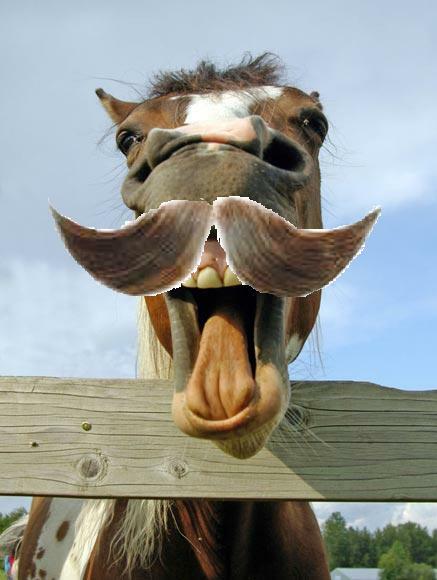 All I know is Alfie the mustache horse is officially the most badass horse in all of England, and should not be kept in a stall in the countyside. He should be rollin’ in a late 80’s Mark III van, listening to Frampton and banging show ponies behind the stables. Yeah, I’ll show you a paddock. Wait, what?